Mon-Fri : 9 A.M - 6 P.M. Sat : 10 A.M. - 4 P.M.
Keep up to date with events, new pieces and more! Beautiful diamond 4-leaf clover necklace, custom designed and built by J. Lewis Jewelry in Bellevue, Washington. "Love, love my custom engagement ring that Kelsie designed for me!" "The ring itself turned out absolutely amazing!!!" "When I met Jill to size it, I was a fan for life!! She is amazing, listening to everything you want and wish for and does her best to make it a reality." "Highly recommend for finding/creating your engagement ring!" 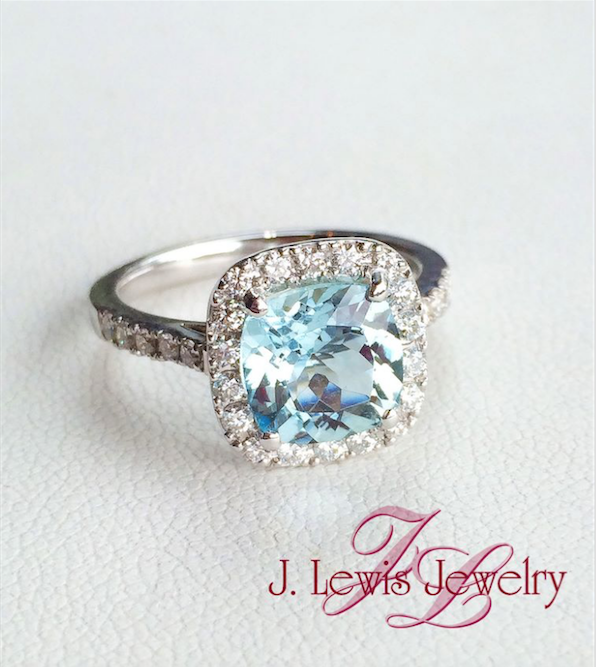 "I went to J. Lewis Jewelry on the strength of reviews here on Yelp, but my plan was to visit several stores. My husband and I took in an old brooch from my grandmother that had numerous tiny diamonds. Our goal was to create a ring with some of the diamond"
"Kelsie is extremely professional and very informative when I buy things there. I walk out with confidence knowing that I purchased a fine piece of jewelry. Would recommend to anyone!" The perfect March birthday gift, an Aquamarine and Diamond ring.